I would like to share this idea with anyone who might live in a dry area, not have easy access to water or who might simply be forgetful about watering plants. 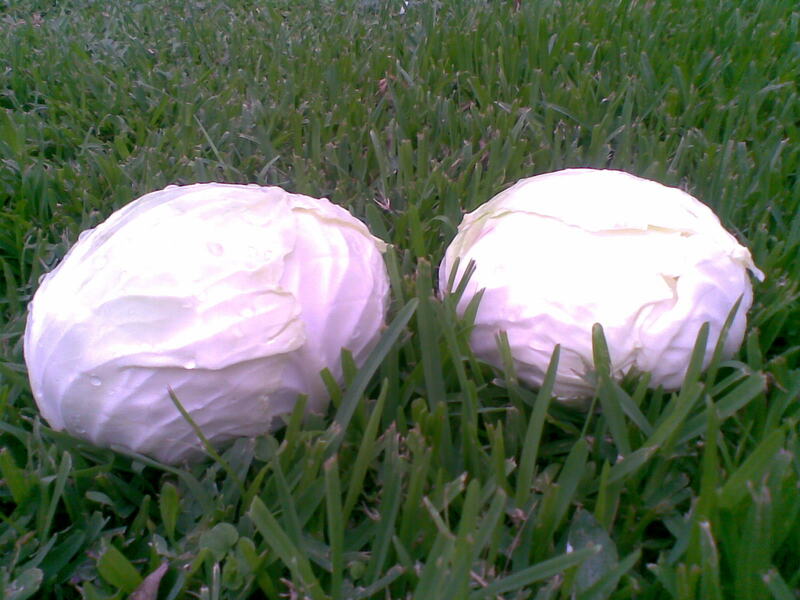 Due to water restrictions on this property I am unable to water my garden. This is a brilliant solution that Bob, my good friend, neighbour and fellow growing enthusiast emailed me. It is a wonderful article titled “Circle Gardens: a discovery par excellence!” (pdf format) written by Pat Featherstone of “Soil for Life”. 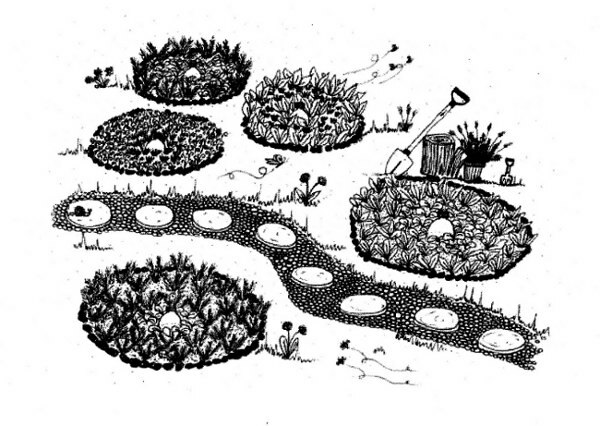 It contains simple and concise instructions on how to make a circle garden. Thank you Pat for kindly giving me permission to use your delightful hand drawn diagrams to insert in-between my photographs. They brought special inspiration! 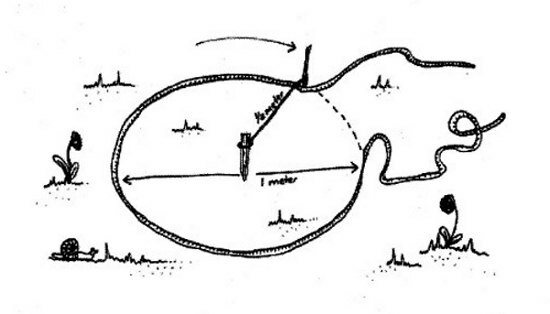 This is a diagram of the first step.. 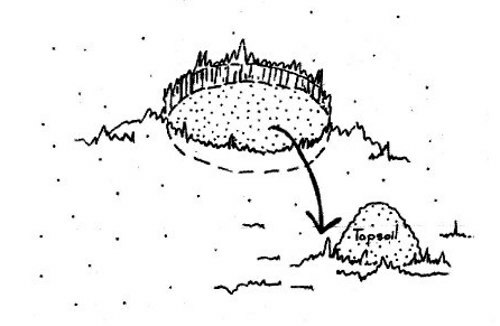 Remove 20-30 cm of the topsoil and place in a neat pile beside the circle. Placing the subsoil and topsoil in separate piles. Making 16 holes in the bottle with a hot needle. 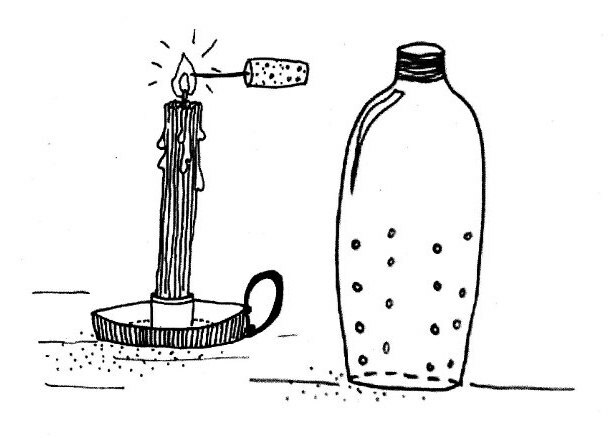 Stick an old sewing needle into a cork to insulate your fingers – heat it in the flame of a candle – and push the needle into an empty 2 litre plastic bottle. Melting 16 holes in vertical rows as shown. Covering the bottom layer of the hole. Place a layer of cardboard, newspaper or egg boxes covering the base of the knee-deep hole. I added a layer of kitchen refuse. Using the subsoil to fill the lower layers. Place the bottle at the bottom of the hole, in the centre of the circle. 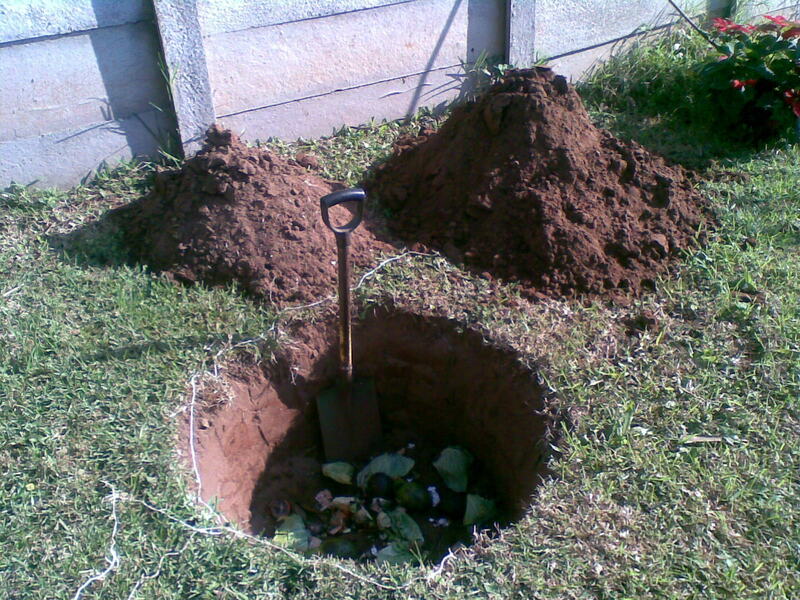 Add a 2 cm layer (one finger) of compost (or well-rotted kraal manure, kitchen waste or dry grass, or cardboard) in the base of the hole and cover this with an 8 cm layer (four fingers) of subsoil. Water these two layers well. Bottle placed in the hole. Continue replacing the subsoil, layering it with compost (or the other materials mentioned above) and watering each layer as you go until all the subsoil has been replaced. After replacing the soil with added layers, I flooded the hole thoroughly in-between addition of layers. By adding organic matter and watering each level in turn a sponge effect is created which will retain water below the surface so that plant roots are encouraged to grow downwards, giving them greater strength. Surface watering tends to make plant roots stay near the surface. 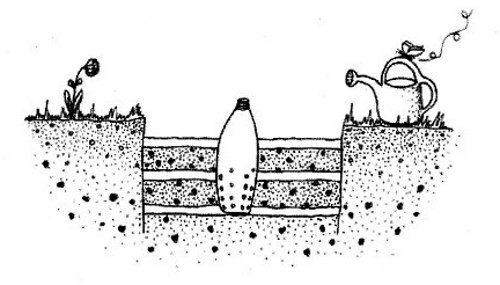 The sponge effect is maintained by the burying of the bottle (or alternatively a tin can with holes in the bottom) into which water can be poured so that all the plants in the ecocircle can be reached with one watering session. When the top soil is replaced it will be higher than the surrounding ground, forming a raised bed. Having added all the subsoil, replace the topsoil. The surface of the bed will be higher than the surrounding ground. This creates a raised circular bed. 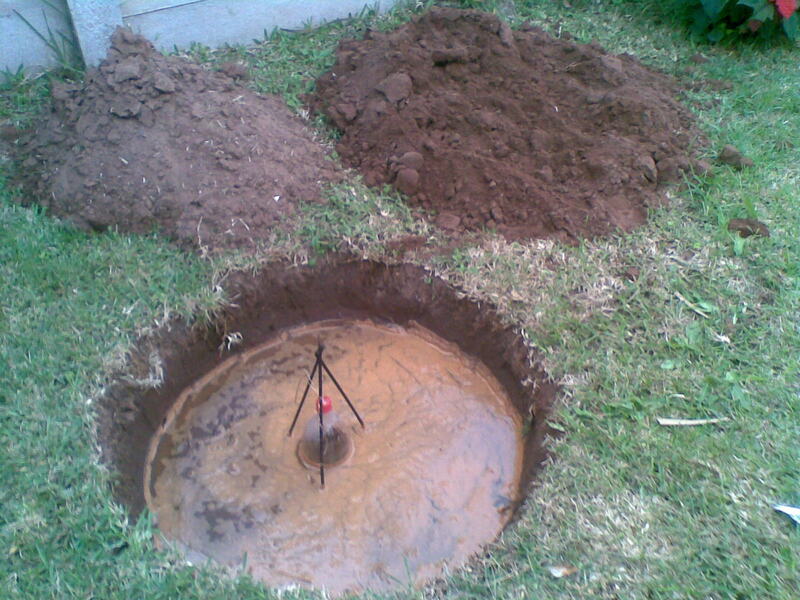 Scoop the soil towards the outer edge making it a basin shape - lower in the middle. In areas of high rainfall, the surface of the bed should be flat to prevent water-logging. 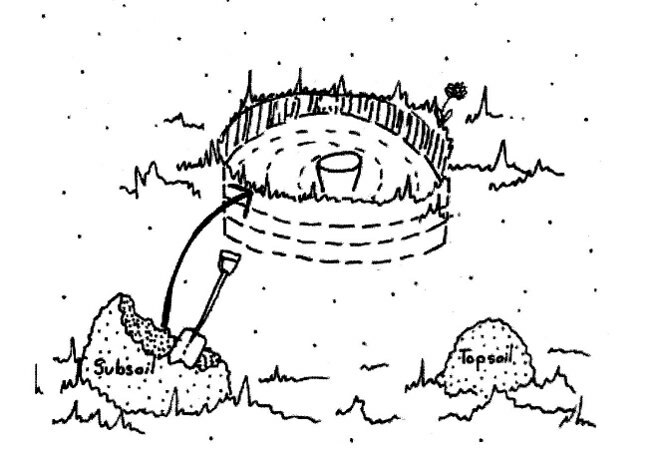 In dry areas the basin shape promotes the sinking of water. Filling the bottle with water. Fill the bottle with water (it is only necessary to do this once a week if the bed is well mulched. This means that you are using only 2 litres of water per bed per week. 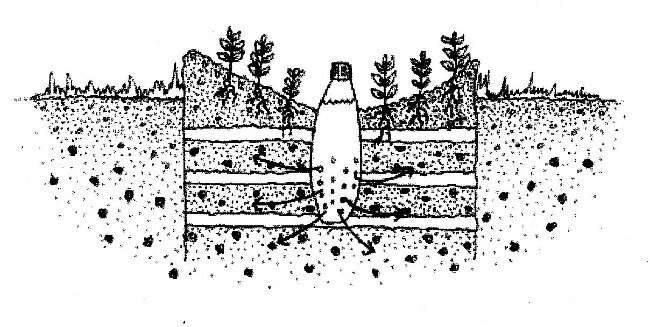 Tighten the cap and then loosen a little but so that no vacuum is created once the water drips out into the soil. Deep watering encourages good root growth. A strong, well-developed root system will ensure a healthy plant. 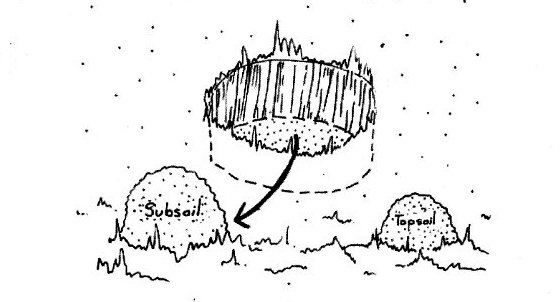 Mulch the surface of the basin and plant seeds or seedlings on the inside of the ridge, in circles.Very young seedlings planted in the centre of the circle are protected from wind. Keep the beds well mulched to retain water. 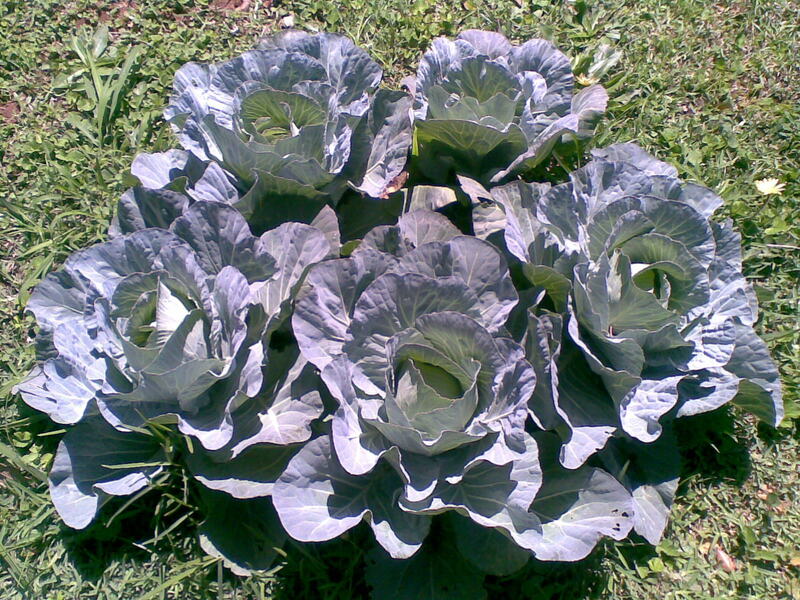 One bed can accommodate 10 lettuces or 5 to 8 cabbages, or 4 rows of beans or a variety of different crops. Five cabbages, interplanted with faster growing lettuces that were harvested earlier. Records on planting and crop rotation can be kept easily and accurately to ensure good soil, and therefore, good plant health. I have now prepared 5 circle gardens in total. I have found that the surrounding area of the circle gardens has retained a lot of moisture, and is looking quite lush so I have decided to link them with “no dig” beds. 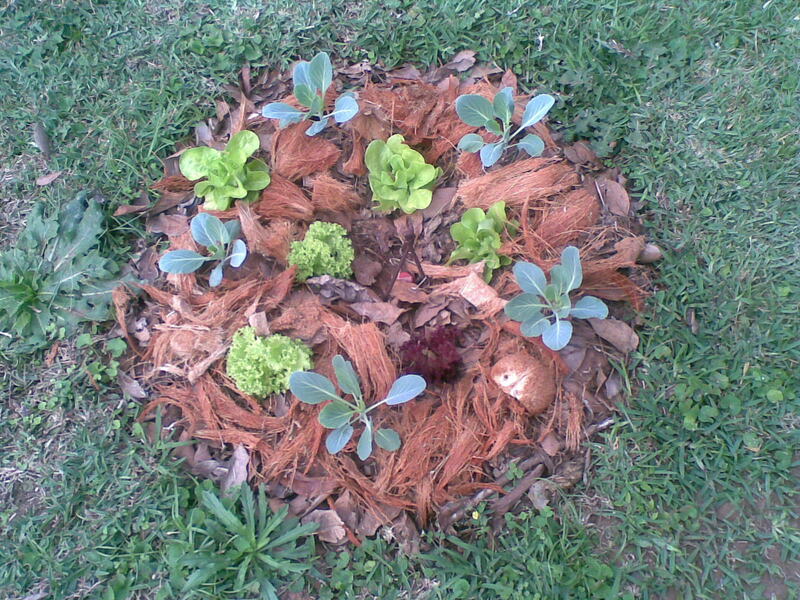 They are prepared permaculture style – I have made spokes joining the beds. The layers of cardboard and mulch will be soon ready to plant up. That will be my next update. I hope you have enjoyed reading this post and are inspired to make your own! Please leave links to your circle gardens (or other good gardening ideas) in the comment box…..I would love to hear from you. 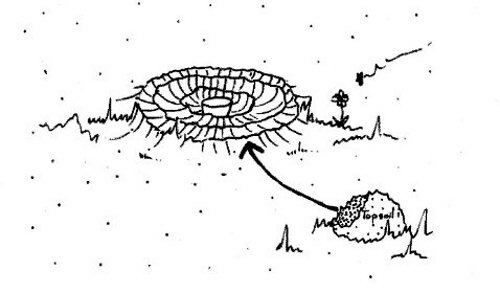 This is a link I really enjoyed on planting a spiral garden. And this link to a Ugandan Keyhole garden posted by “Garden Castle” on face book. Thank you.